Hard: Levels 90 or higher. Maximum of 5 attempts per day. The Ariant Survival quest, called Nett's Pyramid, can be found a few maps away from Ariant, in Sahel 3. Nett, the God of Chaos and Revenge, and whom is a Pharaoh Yeti, demanded that his temple to be risen from the depths of the sandy Ariant Desert. Many challengers from afar will try to conquer Nett's test; an unlimited wave of creatures to be destroyed in order to please the Yeti. Those who live from the bloody reins shall be honored by the God, but those who fall shall face demise. This party quest is similar to a tower defense type of game, and is comprised of 20 waves. There will be 4 lanes, and each member takes each lane. They will have to kill monsters going towards the Obelisk. Each monster deals 1 damage to the Obelisk, except the Pharaoh Yeti, which deals 2 damage, and the Pharaoh Mummy, which deals 5. Once all 20 life points are gone, the party loses. Anubis' Eye: Increases 40 attack for 15 seconds. Costs 500 points. Osiris' Eye: Stuns monsters for 1 second. Includes Pharaoh Yetis and Pharaoh Mummies at a 30% chance. Costs 500 points. Isis' Eye: Does Damage over time to all monsters for 15 seconds every second. Costs 500 points. Horus' Eye: Slows down all monsters for 15 seconds. Includes Pharaoh Yetis and Pharaoh Mummies at a 30% chance. Costs 700 points. Ra's Eye: instantly kills the first 20 monsters that are the nearest to the obelisk. Deals 10% of the HP to Pharaoh Yetis and Pharaoh Mummies at a 30% chance. Costs 2,000 points. Points can be acquired by damaging monsters. The monsters in each wave consist of the following: (the numbers next to each monster indicate that it has more HP than the previous version of it (for example, Giant Scorpion (3) has more HP than Giant Scorpion (2). and that has more HP than Giant Scorpion (1)). 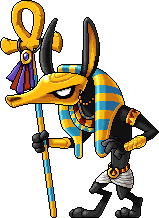 Collect 300 Nett's Emerald for a time-limited Immortal Pharaoh Ring (+2 to all stats, +100 HP/MP). EXP is also awarded at the end of the whole quest. The EXP received will vary with your team's ability. Note: The monster stats listed here are the base stats (before the PQ stats get calculated), and therefore NOT what you should expect when doing this PQ. A skeledog found in the Pyramid at Nihal Desert. A skeleton found in the Pyramid at Nihal Desert. A scorpion found in the Pyramid at Nihal Desert. Based on the ancient Egyptian God Horus. Found in the Pyramid at Nihal Desert. He can increase the speed of nearby monsters by 30. A mummy found in the Pyramid at Nihal Desert. It is able to heal around 30,000 health to nearby monsters. A Yeti wearing a Pharaoh's cap that is found in the Pyramid at Nihal Desert. Resembles the Mini Yeti pet. A mummydog found in the Pyramid at Nihal Desert. Kill these quickly, because they move at a fast speed, and when given a speed buff by Horus, they become even faster. A skeleton horseman found in the Pyramid at Nihal Desert. A cobra snake found in the Pyramid at Nihal Desert. It is capable of slowing your attack speed. The final enemy of Nett's Pyramid. It is capable of slowing your attack speed and stunning. This page was last edited on 8 March 2018, at 05:37. This page has been accessed 39,265 times.